Goodleigh Manor - Awesome view and striking exterior in 1 year new contemporary. Great room w/ two story window bay and view for miles. Modern kitchen w/ granite & stainless, large dining area w/ stone FP . 1st floor master BR w/ private bath, 2nd floor loft and 2nd BR w/ private bath. Huge LL Family area walks out to large patio w/ view. 3 more BR # Full Bath. Propane heat, central AC. Must See! 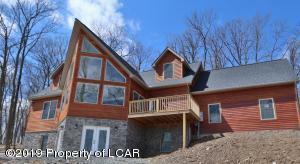 Public Remarks: Goodleigh Manor - Awesome view and striking exterior in 1 year new contemporary. Great room w/ two story window bay and view for miles. Modern kitchen w/ granite & stainless, large dining area w/ stone FP . 1st floor master BR w/ private bath, 2nd floor loft and 2nd BR w/ private bath. Huge LL Family area walks out to large patio w/ view. 3 more BR # Full Bath. Propane heat, central AC. Must See!